Baby and Ocean vs. Bikini: Who Won? As the copywriter at Title Nine, I’ve long had to consider the plight of women of all walks of life when writing — especially when it comes to swimwear. The nemesis of many, friend of few, swimwear seems to be a sticky subject for women of all ages and builds. 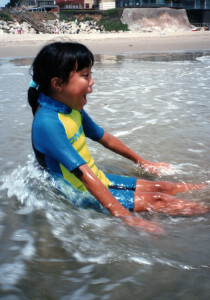 A beach baby at heart, I spent summers slithering in and out of wetsuits or already-wet rashguards in Santa Cruz. My dad used to help me into my little spring wetsuit (which he still has) before paddling me out on his boogie board, my feet barely touching the water, and push me off on waves. Family vacations might find us wetsuit clad in Santa Barbara, or snorkeling in the warm waters of Hawaii. 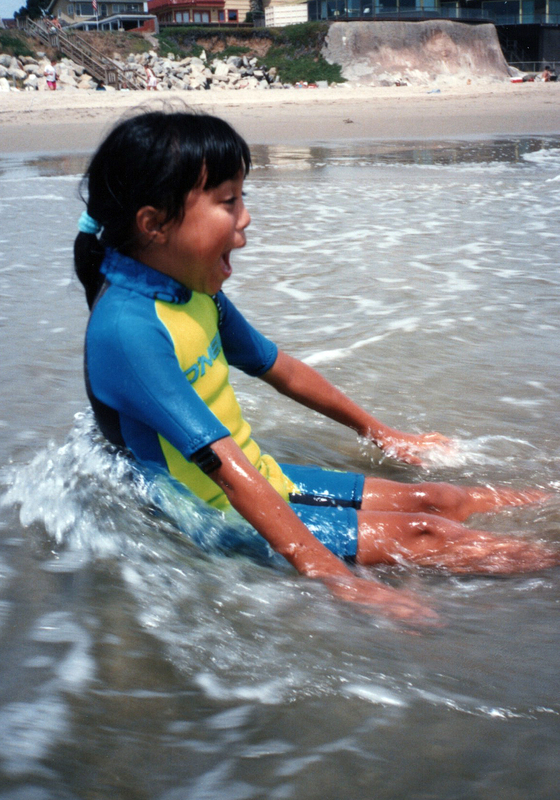 Board shorts and rashguards for women and girls were not as readily available growing up, so as a kid, and even as a tween and teen, I remember getting excited when I finally found pieces that weren’t “shrink it and pink it,” even more so when I found ones that actually fit. This past August I tackled the longest, most rewarding endurance event I’ve taken on to date: childbirth. Having a baby gave me a whole new perspective as my husband and I prepared for our own family vacation: heading to Kauai to visit my parents. Suddenly, thoughts and questions I’d never had before came flooding in: with my new post-pregnancy body, what would I wear to the beach? What suits would work best for nursing and hold up to a grabby-handed six month old? 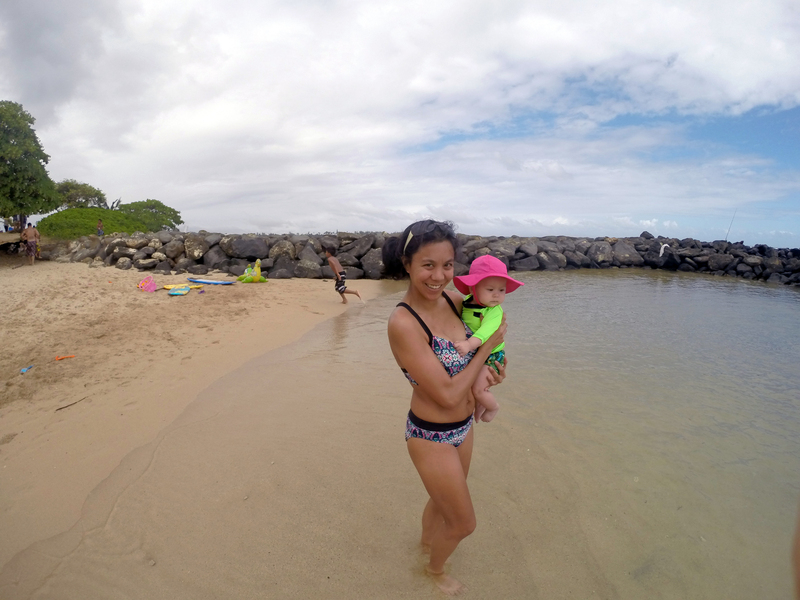 Having a baby did not mean I’d give up wearing a bikini, but as someone who formerly categorized herself as “built for speed,” (a.k.a. small chested) having to find suits that fit a fluctuating 32DD seemed rather daunting. Thankfully, Title Nine let me borrow some of our new swim separates and a few other goodies and put them to the test. 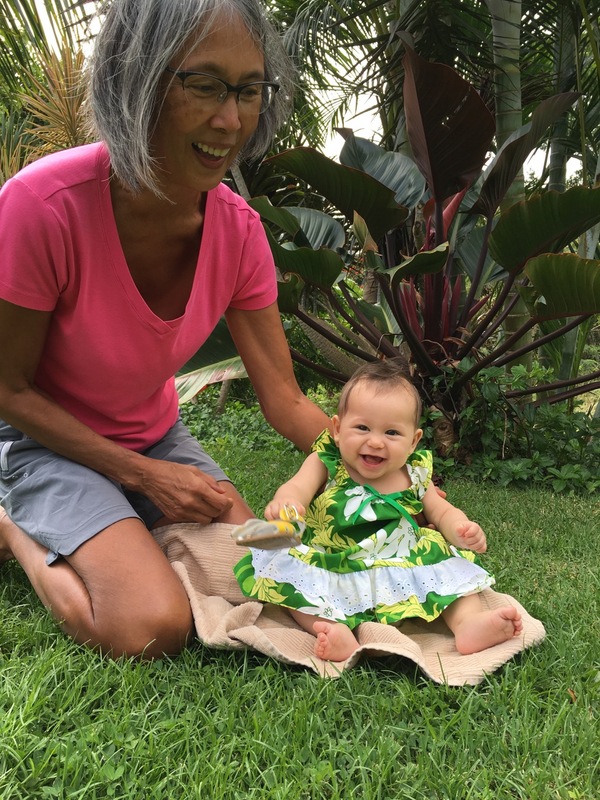 I was eager to pit them against the muggy Hawaiian heat, some serious boogie boarding, and the demands of a nursing baby. If our gear could stand up to all that, it can certainly stand up to anything you have in store for it! 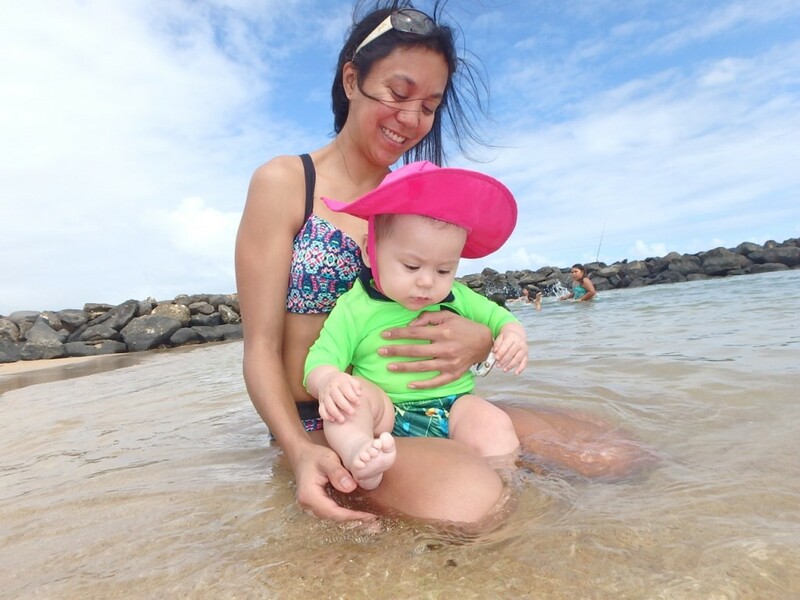 On one of our first days in Kauai we headed to Lydgate State Park, often called “baby beach” because of the protected coves, making it the perfect spot to introduce little ones to the water. It was the same beach where I really started embracing the ocean too. It was time to take my first post-baby bikini for a test drive. Once I had the Pele Bikini top properly adjusted, I felt secure and ready. The adjustable straps gave it the stable support of a racerback. Never having worn a cup-band sized suit before, I appreciated not having to futz with it much to get the fit dialed. The ability to adjust it at the neck as well as at the band was a bonus: it had a halter-like feel, but was sporty in the back, supportive without heavy, wide straps. As someone who already has odd runner’s tanlines, skinny straps were a big bonus! Since the sample Lehua Swim Bottoms I had were a touch big, I used the internal drawcord to make sure they wouldn’t go anywhere. The firm elastic band and good rear coverage helped set my mind at ease that there’d be no full moons that day. My daughter wasn’t sure what to make of all the noisy kids, or the sound of rushing water, so naturally there was some clinging to mom involved. Thankfully, even as she grabbed and pulled, no “oops!” moments were had. If she’d really felt like pulling down one of the cups, we may have had an issue, but for clingy-grabbing we were a-okay. Nursing her in it wasn’t exactly the most convenient because the underwire made it a bit awkward (I went under, instead of over, if you know what I mean) but we made it work without my having to take it off completely. Much to my relief, my kid loved the water and I loved these swim separates. Jogging to the showers and back to rinse off after, I was pleased with the support. While it wasn’t high impact “run a marathon” level support, it was absolutely head and shoulders above other suits that may sport similar appearances. Admittedly, I’m not the cup size recommended for the Plunge Bikini top (best for B’s and C’s), but I rationalized that since I wasn’t going to be running or doing burpees it’d be okay to put the Plunge Bikini top up against some waves if topped off with the Blocker Rashguard. Getting into the top was tricky at first. After letting the straps out so I had wiggle room, I hooked in the front, spun it around and then put my arms through the straps. It’s like putting on a bra, complete with swoop and scoop to be safe. From there I was able to reach behind me and pull down the straps. Once I got the neckline where I wanted it, I tied it off in a bow. (My personal recommendation is a double knot to be safe. More on that below.) With a high neckline and a cut that kept even my girls contained, I knew that grabby hands would be no problem in this suit. Riptides, however, could be another story. I matched the top with the Fearless Hipkini swim bottoms, which I found comfortable and flattering to my more rectangular build. As I paddled out, I quickly I remembered why it’s best to have a rashguard that fits next-to-skin. While rashguards are great for UPF coverage, they also prevent board rash caused by friction. I had board rash as a kid and never want to experience it again. Swimwear always relaxes more when wet, so my already too-loose rashguard kept floating up around my torso. My recommendation: if you only wear a rashguard for sun protection you can size up for a relaxed fit, otherwise, a snug fit is essential. Fins on, walking backwards into the water. While the break wasn’t ideal – a bit choppy since it’s winter – my dad and I caught a few good waves. Then, of course, the inevitable happened. I got dumped off my board, hard. If it weren’t for the leash on my board and tethers on my fins, it would have been a yard sale. I felt my back land hard enough against the sand at the bottom that the bikini top’s bow untie itself partway. 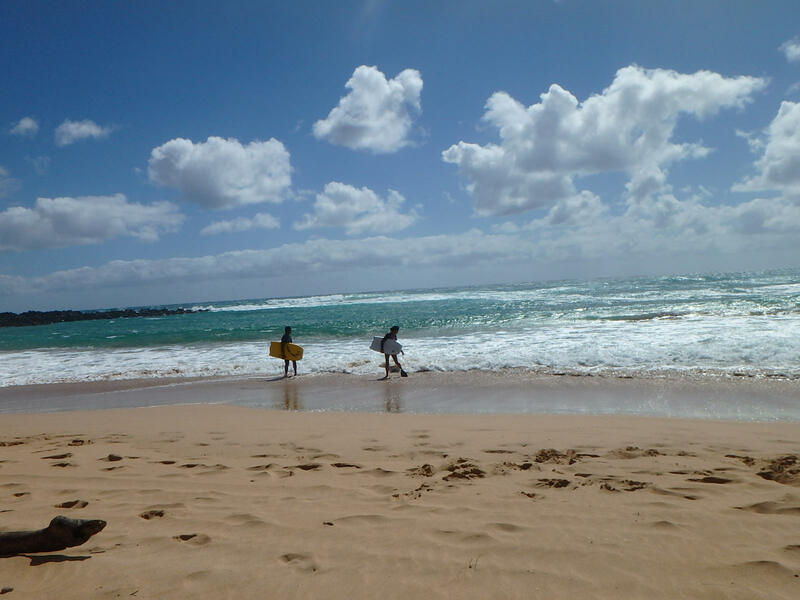 But, hey – what’s a day at the beach without wiping out, right? Luckily, when I surfaced I still had the rashguard and bikini top on, and the wave had only managed to move my swim bottoms such that they needed hitching up. Once I emptied all the sand out of my top, nursing wasn’t too difficult either, but the removable modesty padding was still very wet, so I made sure to squeeze that out first. All three pieces had held up, and no, I did not get board rash! The Volley Short. My new favorite! I also took the new Atalanta Tank and Stand Out Skort for a spin. The Third Eye Tank was just right for trekking along the coast and just around town. The Stand Out Skort saved me room in my beach bag: I may have pulled off my wet swim bottoms and simply slipped on the skort so we could grab a quick bite to-go. The Speed Racer Skirt, which I purchased prior to the trip, was a comfortable swim cover up. Ask my coworkers: usually I am wearing running clothes, so the embossed Nimblene fabric was right up my alley, and the soft panels of Breeze fabric made it extra comfortable as a travel skirt. My mom is now about to buy the skirt and dress for herself, since she wears nothing but Nimblene Rogue Shorts these days. The piece that really surprised me was the updated Volley Short. Stylistically, it makes me want to grabs some tall, striped-top socks and high-top Converse, but it’s truly a performance do-it-all. Not only was it a great swim cover-up piece, I found myself reaching for the Volley Short every day while we were hanging out around the house. 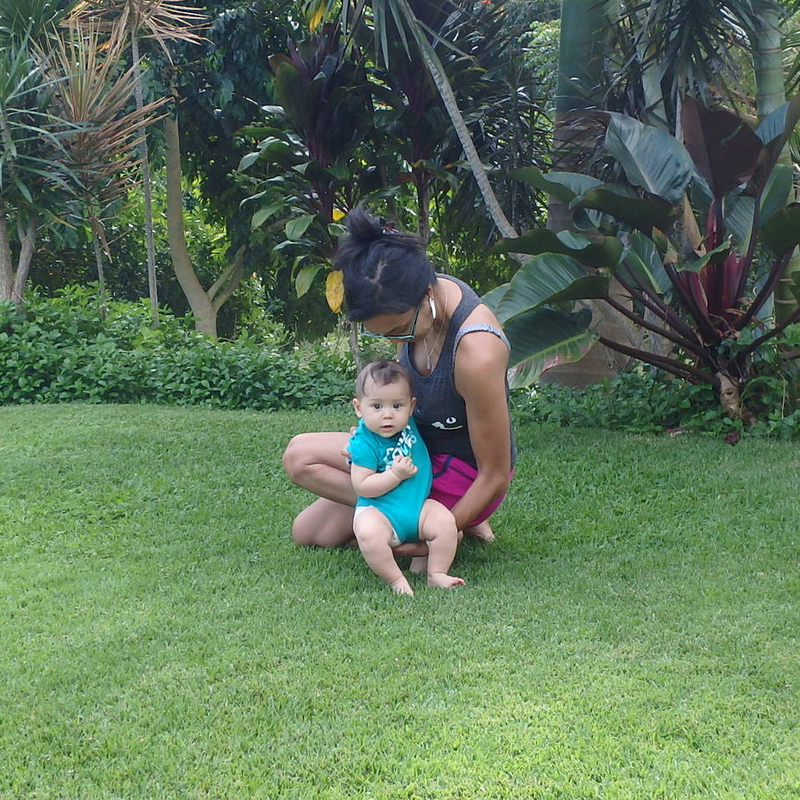 (While hard to see in the picture, we were fresh off our 5 hour flight when I first pulled on the Volley Short and scampered outside with the baby as fast as I could!) Just long enough and breathable enough, with a secure pocket to boot, I now have a run-ready alternative to the running shorts I normally wear. A pair will be following me home soon. 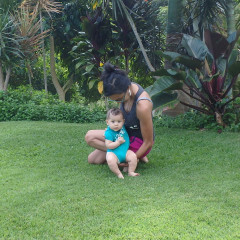 I was very pleased with the new gear I got to test during my first travels-with-baby. 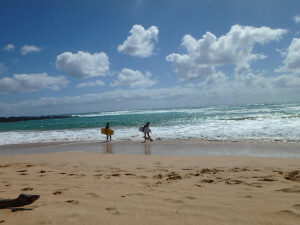 The swim separates fit well, worked for nursing, and survived big waves and tiny hands. The versatility of it all kept me comfy and helped me save room in my luggage. Have you traveled with Title Nine gear? What are your favorite traveling pieces? Photos taken with a GoPro Hero3 and Olympus TG-850 by family. New(ish) mother runner, soccer player, vegan baker, and in-house Title Nine copywriter, brand voice, and product knowledge educator, Christina be found online via her blog.